The oldest skipjack still sailing, Rebecca T. Ruark is a privately owned Coast Guard inspected passenger vessel and offers public sails out of Tilghman Island, Maryland. The story of Rebecca T. Ruark is the story of the skipjack. She is the oldest surviving skipjack, but despite her age, or perhaps because of it, her story is well documented. Rebecca's story begins in 1886, only three years after the first documented skipjack, Eva, was built. Rebecca T. Ruark dredged, hauled spat, hauled passengers, sank, was raised, has been repaired, restored, rebuilt and rebuilt and rebuilt. She is a survivor. And she originally was not a skipjack. Moses Geohegan built the boat in Taylor's Island, Maryland, for William T. Ruark, who named her after his wife, Rebecca Travers Ruark. The boat reportedly started out as a schooner, with two masts, but by the time of her earliest documentation in 1887, she had a single mast and was a gaff-rigged sloop with a square sail and top sail. 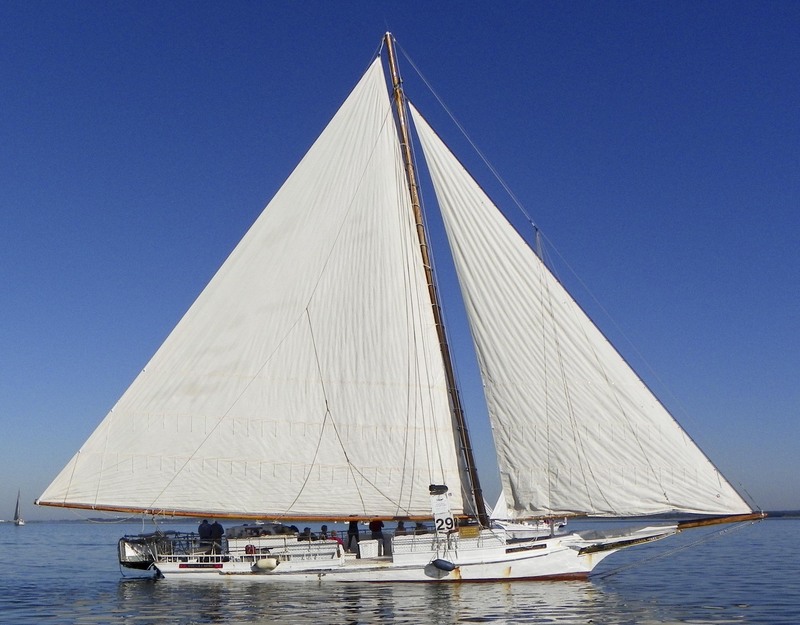 It wasn't until the 1920s that she was changed to her current skipjack rig. Her home port was Baltimore for the first few years. 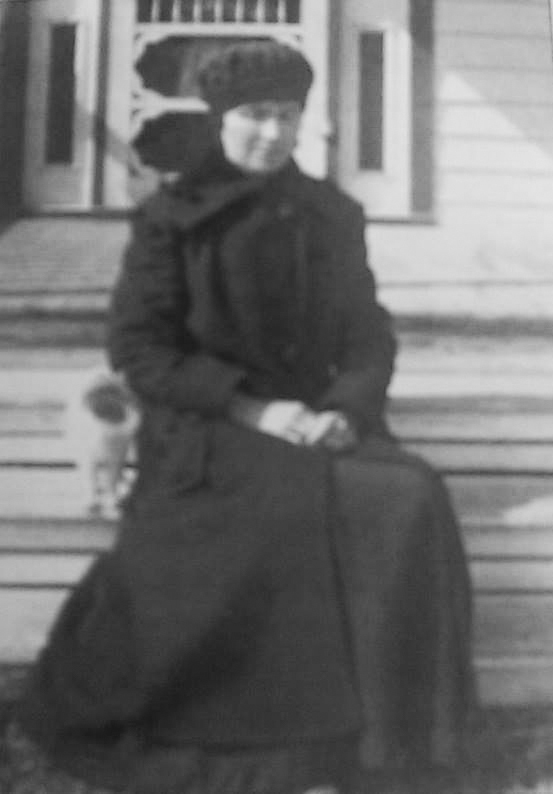 She relocated to Crisfield, Maryland, in 1899, then back to Baltimore in 1902. On 16 September 1923, W. Alvin Cook of Cambridge, Maryland, became her owner. On 19 December 1939, she was sold to Herman L. "Pinky" Cook for $5, possibly due to Alvin's death and Herman being his executor. On 8 August 1951, Emerson G. Todd and his wife Linda bought Rebecca from Cook, again for $5. In the "Roster of the Famous Skipjack Fleet" for the 1962 race at Solomons, Maryland, Rebecca T. Ruark is listed with tonnage (cargo capacity) as 10, and owner Emerson Todd, home port Cambridge. In 1969, the 83-year-old boat was rebuilt in Deltaville, Virginia. On 3 September 1970, Emerson sold off one-third interests to his sons, Donald and Emerson Jr., again for $5. Like many skipjacks, Rebecca was a family affair. Capt. Scott Todd, owner today of Lady Katie, is Emerson's grandson and learned to sail aboard Rebecca. There probably has not been another expense so small for Rebecca since those $5 sales. After two separate incidents where crew members fell overboard and drowned, the Todds, for $30,000, transferred their ownership into a corporation they set up, Rebecca T. Ruark, Inc., to limit personal liability issues. The boat had—and to many still has—the reputation of being the fastest boat in the fleet, and she also was considered the best dredger. Emerson Todd said, "It can go anywhere on the Chesapeake Bay—in rain or shine or heavy fog. It's the best." Wade Murphy Jr., who then owned Sigsbee and watched Rebecca sail past him on too many occasions, wanted Rebecca, but couldn't afford her. It wasn't until 1984, when Rebecca was rotted out and could be had for only $21,000, that he was finally able to buy her. He still owns her today, sailing her out of Tilghman Island, Maryland. Unlike traditional hard-chine, V-bottom, cross-planked skipjack hulls, Rebecca T. Ruark has a round chine and is fore-and-aft planked (see photos). This makes her fast, but also makes her more expensive to repair and rebuild. After buying her, Murphy took her back to Deltaville for another rebuild, putting $78,000 into repairs and rigging her for oystering and crabbing before she was ready to go back to work in 1986. He sailed her back from Deltaville still unfinished, completing the topside work himself with the help of a friend. For thirteen years, Murphy sailed Rebecca as a dredge boat, sometimes earning extra cash hauling oyster spat and taking tourists for rides. Then, in 1999, Rebecca's story took an unexpected turn. On the second day of dredging season that year, Murphy was out at the mouth of the Choptank River, having hauled in 70 bushels of oysters, when it started blowing a gale. As he tried to get her back to Tilghman, the sails blew out and she started taking on water over the bow. Murphy dumped the oysters, dropped anchor and called for help. A couple boats came out to tow her in, but still two miles out, she sank in 20 feet of water. Murphy and his crew were rescued. Getting Rebecca up was another matter. An attempt the next day cost Murphy $7,000 and failed, but the plight of this historic boat attracted media coverage and the attention of Maryland's governor. The Maryland Port Administration agreed to fund $12,000 for a barge and crane to come out and raise Rebecca on 5 November, hauling her to the Chesapeake Bay Maritime Museum in St. Michaels for repairs which ultimately cost another $60,000. She was relaunched in June 2000. While it hardly must have seemed like it at the time, Murphy later said the sinking was "the best thing that ever happened to that boat." He had Rebecca rebuilt under Coast Guard supervision, including the installation of a watertight bulkhead forward of the mast. This allowed him to increase the number of passengers he could take out from 6 to 49. He gave up dredging and focused on the tourist trade, although in recent years, Rebecca has been dredging once again. Murphy also came up with some imaginative ways to pay for all those repairs. The McCormick Company paid for a new set of sails for him after the sinking, complete with "Old Bay Seasoning" advertised on them. He also arranged for master carver Charles Jobes of Havre de Grace, Maryland, to take Rebecca's old mast, which was being replaced, and carve 82 decoys out of it. The first 20 decoys sold for $500 apiece, most of the rest went for $1000 each, and some were put up for auction, with bidding beginning at $10,000. Rebecca's sinking was not only good for her, but also for the skipjack fleet as a whole. It called attention to the critical condition of the historic fleet and led to the establishment of Maryland's Save Our Skipjacks Task Force in 2000. From the recommendations of the Task Force came the establishment of a Skipjack Restoration Project at the Chesapeake Bay Maritime Museum. A number of the surviving skipjacks benefitted from the program's funding, including Rebecca T. Ruark, which had further restoration at the museum in 2004. In 2009, Coastal Heritage Alliance made repairs of her mast step and stem, which was how we found her when some of the shots on the photos page were taken. In 1985, she was listed on the National Register of Historic Places, and in 2003 was declared a National Historic Landmark. Rebecca has been featured in countless articles, videos and books about skipjacks. The story of Rebecca T. Ruark can't be told without reference to the races. Without a doubt, she's a fast boat. There are two surviving skipjack races, the Deal Island Labor Day race and the Choptank Heritage Skipjack Race in Cambridge. Since 1988, Rebecca and Wade Murphy have won the Deal Island race 12 times, more than any other boat or captain in the history of the race, and they won the Cambridge race four times between 2010 and 2014. Author Christopher White, in his book Skipjack, described racing as "blood sport" for Wade Murphy. He never won a race with Sigsbee, but says, "Ruark can sail herself."